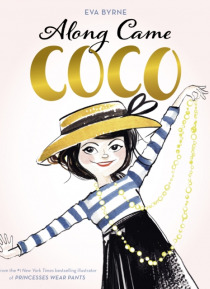 In a time when children were meant to be seen and not heard, along came Coco, a small French orphan with an eye for style, a talent for sewing, and a big imagination. Coco grew up in an orphanage run by very strict nuns, but she wasn't very good at following rules. At a time when girls were told to brush their hair 100 times until their arms were sore, Coco promised herself that one day she would … snip away her locks so that she wouldn't have to be so fussy-girls needed time for other things, and they needed some of the comforts that boys enjoyed. Why shouldn't girls have pockets? And why did they have to wear corsets all the time? An exploration of Coco's early life and a celebration of her creativity, Along Came Coco shows the ways in which Coco Chanel's imaginative spirit led her to grow into one of the world's most beloved fashion icons.